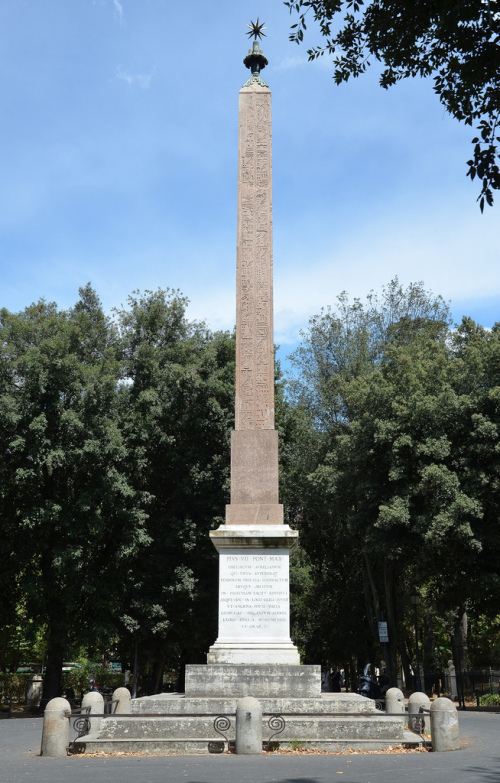 Among the actions of Hadrian after the suspicious death of his “favourite” Antinous was the construction of an Egyptian-style obelisk in Rome, which still stands. Each of the four faces has a text upon it in hieroglyphics. It was constructed in Rome, where someone who knew how to write the ancient language wrote the text. The first two faces read as follows. I’ve made this from the rather splendid French translation of Jean-Claude Grenier, “L’Osiris Antinoos”, CENIM 1, Montpellier, 2008, which I found online here, and which comes with some very learned notes. There are some dreadfully unreliable English versions online, I find. Words said by the Osiris Antinous, [justified], “Come to the master of life.” The blessed one who is in the afterlife and who lies in this sacred place which is found inside the gardens of the domain of the Prince in Rome. He is known for becoming a god in the “abatons” of Egypt, and shrines have been built for him (where) he is worshipped as a god by the prophets and priests of Upper and Lower Egypt and (by) the inhabitants of Egypt also. A city is named after him; to it belongs a population of Greeks and sons of Horus and children of Seth, resident in the cities of Egypt; they have come from their cities, and valuable lands have been given to them, to enrich their lives greatly. There is a temple there of this god – his name is “Osiris Antinous, justified” – built from fair white stone. Sphinxes stand on its perimeter, and statues, numerous columns like those once made by the ancients, and also like those made by the Greeks. All the gods and all the godesses give him there the breath of life, and he breathes in of it, having rediscovered his youth. That’s quite a series of statements about someone who had no known quality to deserve such praise, other than being the “favourite” of an emperor. It is a pity that the meaning of the text is as uncertain as it is. It is not certain, I learn, that the tomb of Antinous was in Rome, rather than in Antinoupolis. It all depends on how you read the text. The obelisk of Antinous on the Pincian Hill in Rome. By Carole Raddato. The emperor Hadrian founded (or refounded) a city in Egypt which he called Antinoupolis or Antinoe, in memory of his favourite Antinous. The city was of considerable extent, and existed into the Islamic period. The ruins were destroyed in the 19th century for building materials to erect a sugar factory. However they were still visible as late as 1798, and the Napoleonic Description de l’Egypte (list of volumes here) contains plans and drawings which are, frankly, rather impressive. The ruins of Antinoupolis. Description de l’Egypte. And here is the plan of the city, albeit at low resolution. 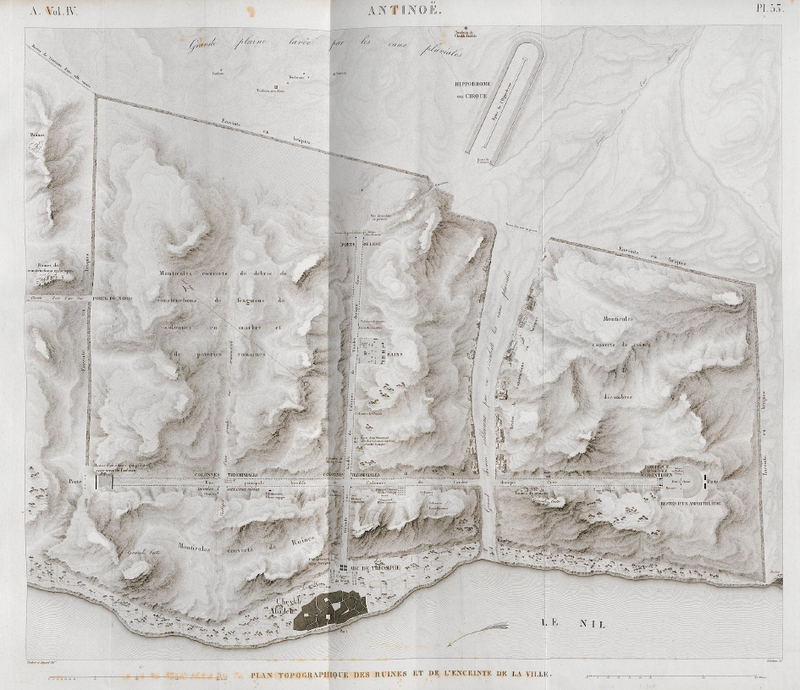 Note the Hippodrome at the top, and the Nile and the modern village at the bottom. Antinoupolis. Plan of the city ruins. I recommend downloading the PDF from Heidelberg – you can zoom into the pictures and see incredible details. There are still ruins at Antinoupolis, of course. A Pharonic temple of Ramasses II still stands, sort of. Modern excavators have been at work. But I think we must all mourn the loss of the magnificent colonnades still visible to Napoleon’s men.